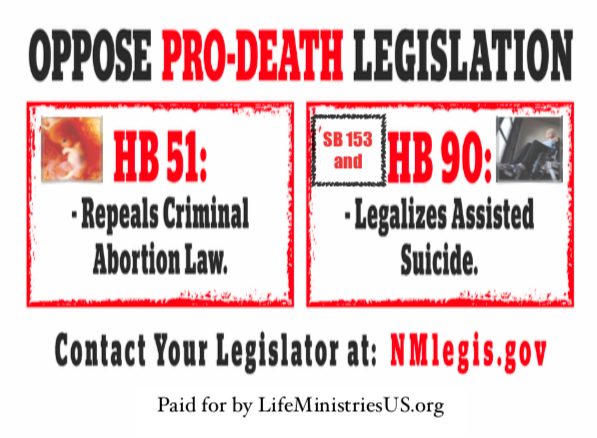 Santa Fe, NM- This is your last chance to let your elected representatives know that you want them to OPPOSE the radical Pro-Death assisted suicide bill HB 90 ELIZABETH WHITEFIELD END OF LIFE OPTIONS ACTbefore the New Mexico House votes on it. Abortion Free New Mexico is committed to preserving life in New Mexico from conception to natural death. HB 90 is the most extreme suicide bill that doesn’t just give an individual the ability to kill themselves, it will also negatively impact those who cannot make these decisions for themselves. Those like Terry Schiavo, who are left at the mercy of their spouse or a child whose parents are mislead by their physician. The acceptance of assisted suicide in our state only expands the culture of death we are fighting so hard to eradicate. Replaces the undefined term: “foreseeable future.” with the normal 6 month terminal diagnosis.